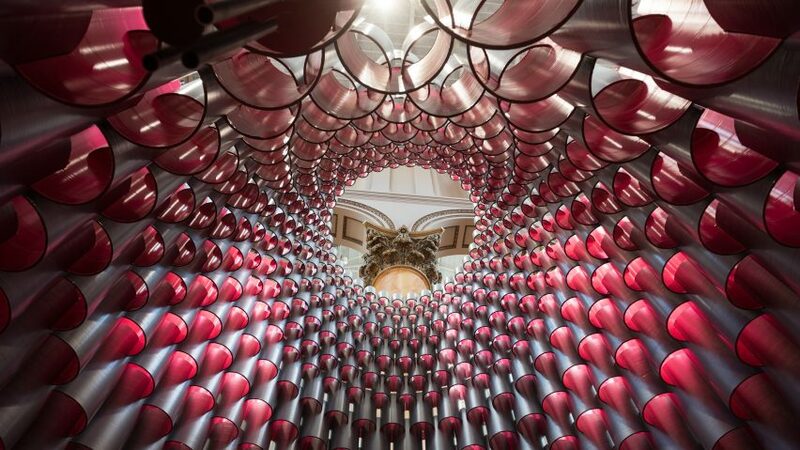 Chicago-based Studio Gang Architects has created a trio of cavernous chambers from stacked silver and magenta paper tubes inside the National Building Museum in Washington DC. The installation called Hive features over 2,700 tubes of paper in varying sizes, locked together to create pavilion-like temporary structures. It is flanked by a pair of smaller chambers furnished with tubular instruments, like chimes, which visitors can play. Studio Gang, which also has offices in New York, chose paper because it is recyclable, lightweight, and renewable. The tubes' silver exteriors and magenta insides are intended to provide a contrast to the eight massive Corinthian columns that support balconies inside the museum's central hall. Open until 4 September 2017, Hive is the latest summer installation to fill the Great Hall as part of the museum's annual series of events and exhibitions, known as the Summer Block Party. Last summer, James Corner Field Operations installed over 30 "icebergs" to evoke a glacial landscape. In 2015, Snarkitecture created a beach-like atmosphere in the space with a sea of translucent balls, following Bjarke Ingels Group's wooden labyrinth the year before. Studio Gang came 95th in the Architects ranking for Dezeen's Hot List last year. The firm has recently unveiled plans for a sculptural glass tower adjacent to New York's High Line and a tiered residential tower for St Louis in Missouri. Photography is by Timothy Schenck, courtesy of Studio Gang.